since they are ONLY responsible for their own local community. To become a BAN Coordinator may not be as hard as you think. All BAN Coordinators are betrayed spouses on their own journey’s to healing from their spouses betrayal. You do not need to be healed to be a coordinator, because all the information is laid out for you and BAN coordinators receive support from the Beyond Affairs Network head office and from Passionate Life Seminars, and Affair Recovery Specialists Brian and Anne Bercht, and BAN’s Assistant Director Tammie Waitley. Step 1 – Read all the information about BAN located on this website: History of BAN, The Need for BAN, BAN Guidelines. Step 3 – Fill in the BAN Coordinator Application Form on this website and submit. Step 4 – We will send you access to the resource page for BAN Coordinators. There you’ll be able to read about how to respond to inquiries, how to facilitate a BAN meeting, how to find a meeting space, and how to get the word out in your local area. Step 5 – After you’ve reviewed the basics, we will set up an interview/orientation with you by phone to answer your questions and make sure leading a BAN group at this time is right for you. As a BAN Coordinator, you and your healing are important to us. We are here to help and support you on your way. Special training for BAN coordinators is also available. Step 6 – When you have yourself and at least 2 other people committed to attend a meeting, you find a meeting location and choose the date time, and let the others know. We have suggested meeting outlines for you, and a set of guidelines. No one is the leader. No one tells anyone what to do. Being a BAN Coordinator does not mean you’re supposed to be healed yourself, or have all the answers. No one plays counselor or therapist. Together you share what has been helpful to you so far, and offer encouragement, understanding and support. 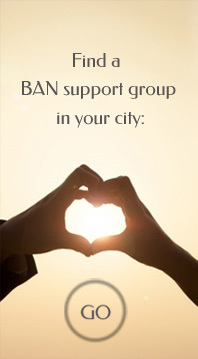 The coordinator has access to a private online discussion forum for all the BAN coordinators worldwide where you can ask questions and get advice about how to run your meetings. At best you facilitate. Most BAN meetings are held once a month and last around two hours. When you become a BAN coordinator, you gain access to a BAN Coordinators Private Page on the website – that is accessible ONLY to BAN Coordinators. 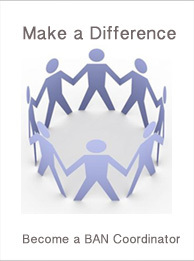 The page provides links to a lot of information to help you in your role as a Coordinator. (and my Responses) that can serve as possible topics for discussion at meetings. This is a group of 7 discussion guides contributed by one of our Coordinators, that provide specific guidance in discussing some key topics at meetings. This provides good perspective as you work with others in going through the slow, jerky road to recovery. please fill in the BAN Coordinator Application Form. We’ll be in touch with you shortly to guide you in a very personal way! you can periodically check the List of Cities to see if someone else has volunteered. I encourage you to read EVERYTHING on BAN’s sister website www.beyondaffairs.com and listen to some of the many free audio seminars on all aspects of affair recovery – so that at least you can recognize that you are not alone – that many others have been and are going through this experience. I also encourage you to reach out to find SOMEONE you can confide in and talk to – even if it’s not in a support group. The isolation is one of the most difficult factors that makes recovery more difficult.